Hockney was born in Bradford, England to Laura and Kenneth Hockney and educated first at Wellington Primary School. After being educated at Wellington Primary School, he then went to Bradford Grammar School, Bradford College of Art and the Royal College of Art in London, where he met R. B. Kitaj. While still a student at the Royal College of Art, Hockney was featured in the exhibition Young Contemporaries alongside Peter Blake that announced the arrival of British Pop Art. He became associated with the movement, but his early works also displayed expressionist elements, not dissimilar to certain works by Francis Bacon. Sometimes, as in We Two Boys Together Clinging (1961), named after a poem by Walt Whitman, these works make reference to his love for men. 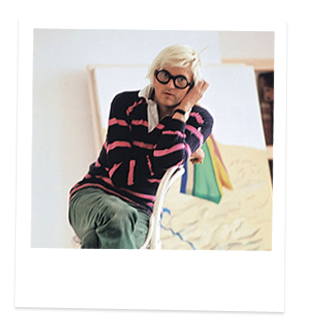 From 1963, Hockney was represented by the influential art dealer John Kasmin. In 1963 Hockney visited New York, making contact with Andy Warhol. A later visit to California, where he lived for many years, inspired Hockney to make a series of paintings of swimming pools in Los Angeles, using the comparatively new Acrylic medium and rendered in a highly realistic style using vibrant colours. In 1967, his painting, Peter Getting Out Of Nick's Pool, won the John Moores Painting Prize at the Walker Art Gallery in Liverpool. He also made prints, portraits of friends, and stage designs for the Royal Court Theatre, Glyndebourne, La Scala and the Metropolitan Opera in New York City. David Hockney has also worked with photography, or, more precisely, photocollage. Using varying numbers of small Polaroid snaps or photolab-prints of a single subject Hockney arranged a patchwork to make a composite image. One of his first photomontages was of his mother. Because these photographs are taken from different perspectives and at slightly different times, the result is work that has an affinity with Cubism, which was one of Hockney's major aims—discussing the way human vision works. Some of these pieces are landscapes such as Pearblossom Highway No.2, others being portraits, e.g. Kasmin 1982, and My Mother, Bolton Abbey, 1982. These photomontage works appeared mostly between 1970 and 1986. He referred to them as "joiners". He began this style of art by taking Polaroid photographs of one subject and arranging them into a grid layout. The subject would actually move while being photographed so that the piece would show the movements of the subject seen from the photographer's perspective. In later works Hockney changed his technique and moved the camera around the subject instead. Hockney's creation of the "joiners" occurred accidentally. He noticed in the late sixties that photographers were using cameras with wide-angle lenses to take pictures. He did not like such photographs because they always came out somewhat distorted. He was working on a painting of a living room and terrace in Los Angeles. He took Polaroid shots of the living room and glued them together, not intending for them to be a composition on their own. Upon looking at the final composition, he realized it created a narrative, as if the viewer was moving through the room. He began to work more and more with photography after this discovery and even stopped painting for a period of time to exclusively pursue this new style of photography. Frustrated with the limitations of photography and its 'one eyed' approach, he later returned to painting. From - Wikipedia, David Hockney, Online 17 Feb 2011. COPYRIGHT © 2011 DAVID HOCKNEY. ALL RIGHTS RESERVED.